Once you've explored our new or used Ford inventories and taken a test-drive of the perfect model for you, you're ready to get started with the Ford financing process. You may be overwhelmed by your financial options when buying or leasing a Ford car, truck or SUV, but the experts on our Ford financing team are here to help! Speak with the team our Ford dealership near Andover, KS, and let us answer any questions you may have about Ford credit approval, Ford lease or loan options, the differences between buying or leasing a Ford and so much more. Whether you're leasing a new Ford Escape SUV or financing a used F-150 pickup, it doesn’t matter -- our Ford financing department is here to make the purchasing process streamlined, stress-free and simple. 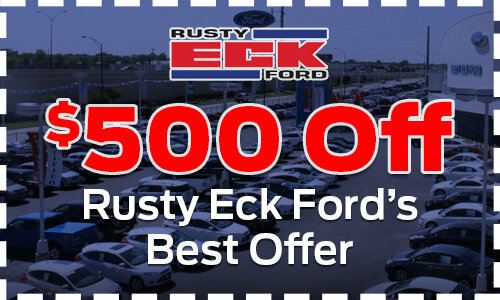 Get behind the wheel of a Ford you'll love at Rusty Eck Ford, then speak with our Ford financing team to figure out the best financial options for you!